In Saint Cloud, our BLS classes deliver the information you need to work efficiently and effectively, and improve patient outcomes. When you sign up for in-person BLS training, you'll spend approximately 4.5 hours learning the latest information and studying the newest techniques. From CPR and AED usage, to problem solving and team dynamics, our classes cover it all in a way that's easy to understand and easy to implement. 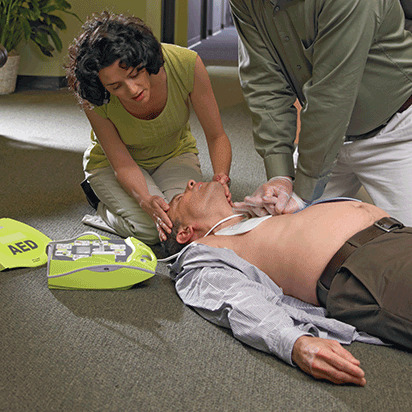 At the Red Cross we make earning your BLS certification simple. With in-person BLS training in Saint Cloud, as well as our Simulation Learning experience, which combines online coursework with in-person skills sessions, you can find a class that works with your schedule and your learning style. In addition, we offer customizable BLS training for organizations that can incorporate local protocols so your team can train the way they respond. At the American Red Cross, our Saint Cloud BLS classes are designed specifically for healthcare providers and first responders who are faced with a myriad of situations every day. To help prepare you to respond appropriately, and in a way that offers the best possible patient outcomes, our courses cover a wide range of topics, including CPR, First Aid, and AED usage, as well as scene safety and assessment, critical thinking, problem solving, communication and teamwork, the emergency medical services system, legal considerations, and more. We not only offer BLS classes in Saint Cloud, but we make it possible for you to become a trainer, and proctor certifications for members of your own organization and your community. To help you become a Red Cross trainer, we will recognize your current instructor certifications and offer free instructor bridging. Along with our portfolio of BLS classes, we are a leading provider of OSHA-compliant health and safety training, offering a wide range of training programs to our partners, including First Aid/CPR/AED, Wilderness and Remote First Aid, Babysitting, Lifeguarding, and more. In Saint Cloud, BLS certifications are valid for two years. If your certifications are nearing their expiration date, or are within 30 days of expiring, you can take an abbreviated course that will allow you to learn the latest information and sharpen your skills, and renew your credentials for two more years. Although you hope that no one ever needs your services, as a BLS practitioner it's your job to be prepared to respond quickly, and appropriately. In order to do so, you must maintain your skills long after your Saint Cloud BLS training has ended. In order to help you stay ready to respond, we've outlined some high-level steps that apply to most scenarios, and offer a wide range of reference materials that you can use to remind yourself of the steps required during specific situations. To augment your Saint Cloud BLS training experience, we've developed step-by-step guides and a BLS Handbook that you can use during class and long after your training has ended. In our handbook we've outlined emergency procedures in detail, and in a way that reflects real-life scenarios. This way, you can learn how, or remember how, to provide the best possible care to those in need. First responders and healthcare providers deliver life-saving care in times of need. And at the Red Cross, we have more than 100 years of experience in training individuals who will be there when you need them most. When you join one of our Saint Cloud BLS training classes, you'll not only learn from experience professionals who understand the situations that you'll face every day, but you can rest assured that the information and techniques discussed in class are both proven, and at the forefront of innovation. After all, every course we offer, including our BLS classes, are developed under the guidance of, and reviewed by, the renowned Red Cross Scientific Advisory Council.